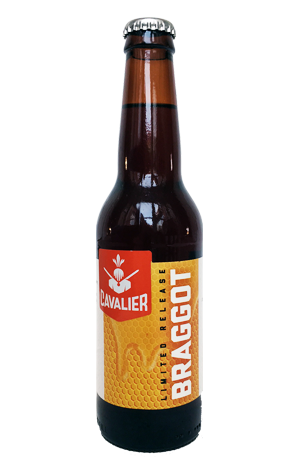 On a visit to Australia, one of America's leading mead producers, Moonlight Meadery, hooked up with Cavalier to create a braggot. "A what?" you may well ask. It's a drink that brings together the meads of the former with the ales of the latter in the one beverage – a style we first encountered in Australia via Red Duck's Ugly Duckling and Bridge Road's Megachile Pluto that has its origins in medieval Britain. Cavalier and Moonlight Meadery's take is lower in booze than that pair, pours a deep auburn hue and is unlike most boozes you'll come across. It presents as boozier than it is, with an acidic tang underpinning fortified dark honey flavours and a touch of dark fruitiness. It sits in the "acquired taste" category but, when you're creating a medieval beer style, would you expect anything else?